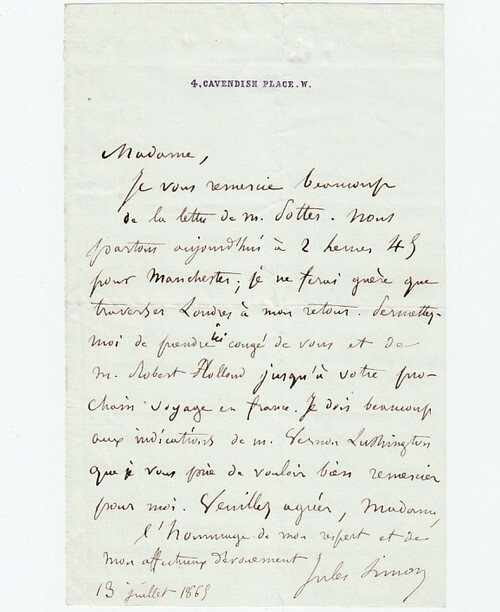 Autograph Letter Signed, to ‘Madame’, saying that he is just about to leave for Manchester, with mention of Vernon Lushington and his correspondent’s forthcoming journey to France with Robert Hollond. In French. 1 page 7 x 4.5 inches. In good condition. 4 Cavendish Place [London], 13 July 1869. Jules François Simon (1814-96), French statesman and philosopher.